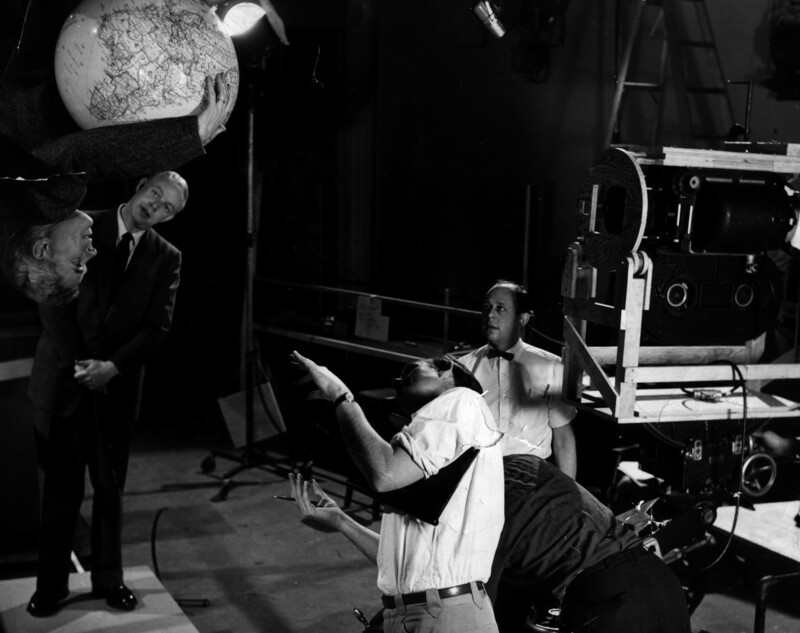 The physics films made under the auspices of the Physical Science Study Committee (PSSC) in the late 1950s and early 1960s are considered landmarks in the genre of the classroom science academic film. This page consists of a short description of these films by Geoff Alexander, and Richard Leacock’s reminiscences regarding the creation of these films, followed by a filmography. See also Warren Everote’s description of the PSSC program. Zach [program director Jerrold Zacharias] tended to assign the subjects that were complex, as in this case, or those where the teachers were complex as with Bitter, with whom Zach did not get along, Rogers, at Princeton who was known as a star lecturer (he had been the physics teacher at Bedales, the school I was sent to in England) I think I was the only film maker around who had majored in Physics at College so, at least I knew the language. My favorites are Frames, Crystals, with Allen Holden of Bell Labs (one of the group that discovered the transistor), there is an extraordinary shot in that where we melted some Saylol (spelling?) crystals under the microscope and then let them grow; they go from blobs into perfect diamond shapes. Holden was a wonderful scientist and caused me to revise my opinion of Bell Labs, an extraordinary product of the world of monopoly! Coulombs Law and another with Eric Rogers were more like filming a star actor doing his thing. At the end of the proof of the inverse square law (à la Cavendish) the young girl who we charged up with a couple of million volts to make her hair stand on end, is my eldest daughter, Elspeth. She is still mad at him because he promised to send her a Wimshurst Machine and never did. A Magnet Laboratory (1959), featuring the fabled and sartorially disheveled Dr. Francis Bitter of MIT experimenting with powerful electro-magnets, and ultimately setting one experiment on fire, and quelling it with a nearby fire extinguisher. Breaking nearly every rule established for the relatively staid science community, Leacock, who himself studied physics at MIT, utilized the lab as a sort of constructivist stage, at one point “breaking” a researcher at mid-torso in the upper right of the frame to linger for several minutes, rear-end to camera. Perhaps the most arresting moment of the film occurs roughly half way through the film the telephone rings, an off screen voice says “it’s for you,” and Bitter, without missing a beat, responds "tell 'em I'll call 'em back later." Leacock gives every physicist in the lab a personality, from the droll Bitter, to "Beans" Bardo, the wonderfully-named technician whose responsibility it was to crank up the 12 foot high, twenty foot long generator to nearly explosive proportions while drowning out Bitter’s attempt to explain what was about to occur. Assistant Dr. John Waymouth is almost as funny as Bitter, exhorting Beans to “fire when ready, maestro!” before engaging Bitter in a duel of magnet power, culminating in the accidental calamity of catching the experiment on fire. The filmmaker fondly remembers working with Bitter, a constant thorn-in-the-side of the staid MIT Physics department both in the lab and at departmental parties, often accompanied by his outspoken, flamboyant, and attractive wife, renowned for needling her husband’s self-important colleagues. Three other Leacock-directed PSSC films are worthy of note. Crystals (1958) features Bell Lab’s Alan Holden’s dry humor, describing his own private fun in growing crystals, diametrically opposed to the manic Princeton professor Eric Rogers hosting Leacock’s Coulomb’s Law (1959). Rogers is animated, continually removing and replacing his eyeglasses, ordering around lab assistants --- he forcefully breaks a glass test tube in the hands of an assistant to demonstrate the inelasticity of water --- and furiously pounds equations on a blackboard (Leacock says the scribblings must have lasted 45 minutes, in what must be one of the more necessary cuts in the history of educational film). Rogers finally conducts an experiment with a young girl, placing her in a metal cage, which he then charges with electricity, demonstrating through the inverse square law that his assistant (Leacock’s trusting daughter Elspeth) is not harmed by the charge. Utilizing a fascinating set consisting of a rotating table and furniture occupying surprisingly unpredictable spots within the viewing area, Leacock’s Frames of Reference (1960), features fine cinematography by Abraham Morochnik, and funny narration by University of Toronto professors Donald Ivey and Patterson Hume, in a wonderful example of the fun a creative team of filmmakers can have with a subject other, less imaginative types might find pedestrian. Others in the PSSC series aren’t as successful, on an affective level: Definite and Multiple Proportions (1960), directed by Herman Engel, is not nearly as quirky and fun as Leacock’s films, and could have possibly more effective as a teaching tool if half of its thirty minute length would have been left on the cutting room floor, while Interference of Photons (1959), directed by Wallace Worsley, like many of the other films in the series, suffers from the lack of camera-presence on the part of its host. This is what we believe to a complete list of the 59 films identified so far as making up the PSSC series. The 1979 EDC catalogue listed 55 in the series, but we have identified four more that weren't in the catalogue. There possibly could be more. Or not. Those with URL links below may be seen on the AFA collection at the Internet Archive. Those marked with an asterisk (*) are in our archive in 16mm format, but need sponsors for digitizing and uploading them. If you'd like to sponsor a film, contact us for more information.